Peace of Westphalia - Though it is commonly called the "Treaty of Westphalia", the proper term for it is actually the Peace of Westphalia. That's because it was not one, but two treaties that ended two wars. They were negotiated over a six month period in 1648 and comprise one of the most sweeping and significant war settlements in Europe's history. The two treaties are named for the cities in which they were ratified, Osnabrück and Münster, both within the Province of Westphalia The two conflicts they ended were the famous Thirty Years' War which engulfed much of Central Europe, and the lesser known Eighty Years' War which resulted in the independence of the Dutch Republic from Spain. Another significant development was that Switzerland gained its independence from Austria. The Peace also introduced a new policy of self-determination which became known as "Westphalian Sovereignty". 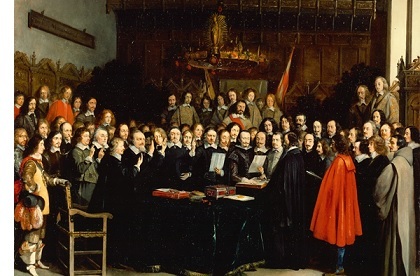 It was the basis for Dutch and Swiss independence and stated that each nation in Europe was a sovereign state, and therefore, could not be ruled by a foreign power. Finally, nearly two centuries before the Congress of Vienna, the Peace of Westphalia tried to establish a balance of power so another conflict like the Thirty Years' War would not happen.